Only a 6 hours or so left. Awesome freebies for pledging 2 sets or greater. Dwarven Forge Kickstarter. Check it out. The Kickstarter's been up for an hour and a half and it's up to nearly $12,000! Last edited by Totally Guy; 2013-05-01 at 12:35 PM. I'm partial to using tarot cards for this, myself, but I think a deck with more specific character traits has its uses, too. The motivation/relationships/appearance/occupation categories seem like a good arrangement to me, and the price is reasonable (about $15 for 80 cards). I'm partial to using tarot cards for this, myself, but I think a deck with more specific character traits has its uses, too. The motivation/relationships/appearance/occupation categories seem like a good arrangement to me, and the price is reasonable (about $15 for 67 cards). Last edited by Kingreaper; 2013-05-08 at 02:09 PM. Fun fact: the Exalted 3E Kickstarter blew through its goal in eighteen minutes, and its stretch goals in less than an hour. Wanna see what all this Exalted stuff is about? Here's a primer! That's cool and all, but I'm not sure how I feel about a publisher using Kickstarter to fund its investments. I realize Onyx Path Publishing only started up last year, but it looks like they're asking their fans to do their jobs for them...Especially since they practically seem to be a subsidiary of White Wolf. Last edited by Grinner; 2013-05-09 at 03:56 PM. It's not for third edition itself; that's coming regardless. It's for a deluxe version, basically. Meet the Frog God Games The Tome of Horrors Complete miniatures! Come and get em while they're hot! Two weeks left! Folks here may be interested in this IndieGoGo campaign to get some game designers to GenCon. As of right now, for a $25 donation you'll receive 57 PDFs from 25 different gaming companies. I know Christina and Owen personally, and have worked with Amanda. I can tell you that all three are good people who just need a bit of help raising the funds to get out to the summer Cons. Whether you chip in to help get them there or just to score the massive package of PDFs, either is good enough. Last edited by Zherog; 2013-05-17 at 11:48 AM. Reason: helps if I actually add the URL, eh? A small update on the Eclipse Phase kickstarter. There's a few stretch goals. At 80k, there's a new adventure; at 90k, a character generator; and at 100k, a FATE Core conversion guide. Exciting, yes? FATE Core backers, the final PDFs are in. Check Update #42 for the link. If you like Burning Wheel (Or even if you've never heard about it)-- Check out Torchbearer, it's dungeon-crawling sequel. I'm really excited for this one and will be backing it tomorrow. Just wanted to post a quick reminder and update on this one. It's down to the final 16 hours. The primary goal has been met. The "stretch" goal is to get two "super-reviewers' to some of the summer Cons, so your pledges are still needed. Right now, there are 80 PDF products in the $25 bundle. Even if you don't care about getting folks to the Cons this summer, that bundle is well worth the price; there are some really cool products in there! Check it out! It's not Dwarven forge, but Dungeonstone is releasing some resin 3D cave terrain that actually looks pretty good (check the updates for some appearance improvements that have been made to the floor design since the project started). Almost all tiers are US only, but if I was in the states I'd probably be losing money to this one too. Alea Tools is running a new kickstarter for expanded color selections. It's a pretty good mix; their new colors are pretty great. I'm digging the wine/slime/forest ones. First off, apologies if it is a faux pas here for a publisher to discuss their products. I figured people might be interested in reading about some adventures. I'd like to take a quick moment to mention EN Publishing's latest Kickstarter project. Zeitgeist: The Gears of Revolution, an adventure path for Dungeons & Dragons 4th Edition and for the PATHFINDER RPG, has completed the first of three acts, earning numerous rave reviews, and climaxing with a dramatic battle to save the city of Flint. As we begin to publish the second act, we're offering the chance to get the first five adventures in a beautiful hardcover compilation! Not familiar with ZEITGEIST yet? Our adventure paths always come with two free guides (one for players, one for GMs/DMs) and Island at the Axis of the World, the first adventure free! You can check them out for yourself - we're sure you'll like what you see! Don't just take our word for it - download them for free from right here! This Kickstarter has plenty of awesome rewards. Not only are there beautiful, full-colour hardcover compilations, but there are poster maps, NPC cards, bonus adventures, supplements, and more. By supporting the Kickstarter you not only get a gorgeous hardcover compilation of a top-tier adventure path, but that adventure path itself becomes even better! Thank you for your time, and if you have any questions, I'll gladly answer them here, or at the Kickstarter page. For the record I was running Zeitgeist (my players decided to steal [Spoilers'] ship and turn pirate instead at the end of the first module). It's also arguably the best adventure path I've ever read, with only the original WFRP: The Enemy Within being in anything like the same league. • A proprietary percentile skill and combat system that’s easy for first time pen and paper RPG players to pick up along with some new mechanics that seasoned gamers will find interesting. • A unique system for player constructed inventions. • Biomechanics and other less invasive enhancements such has night vision monocles! • Separate sections of the core book for GMs as well as a Bestiary. 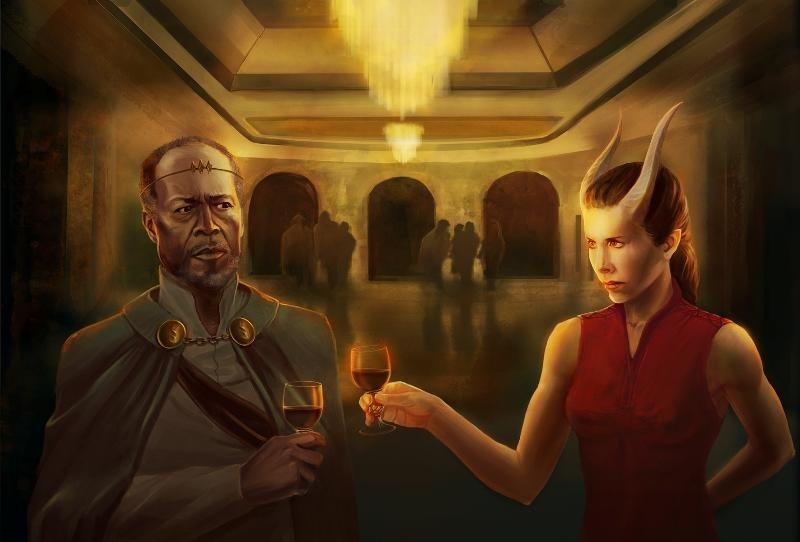 We allow you, our supporters to get involved in the game in a variety of ways, from naming one of the narrators on the journey to Excelsior, naming prominent NPC’s there, and much more! Visit us now at our Kickstarter page http://goo.gl/nSXJR and check us out! We appreciate your support! Our wee bairn of a company, Sasquatch Game Studio, has just launched a Kickstarter campaign for our first project: the Primeval Thule campaign setting. Thule is a savage continent inspired by the works of Robert E. Howard (Conan) and H.P. Lovecraft (Cthulhu). Barbarians! Star-demons! Things Man Was Not Meant To Know! All that good stuff! And it's compatible with the Pathfinder RPG, 13th Age, or 4e Dungeons & Dragons. The lead design team is Richard Baker, David Noonan, and Stephen Schubert. Todd Lockwood is painting the cover, Christopher West is doing maps, and the stretch goals include names like Ed Greenwood, Owen Stephens, and Jason Buhlman. And if you have any questions, ask away! The new Kickstarter for Shadows of Esteren is live ! Our initial goal was reached in two hours and now over 30K$ after only one day. This is amazing! If you have any questions or wish to share your impressions, feel free to post a comment. A crowdfunding campaign is a living project subject to evolutions, and we always welcome feedback! I can't see it mentioned here, which is a bit criminal, but Chuubo's Marvelous Wish-Granting Engine is up to $66k on Kickstarter now, with 3 days to go. That means you can get both the corebook and the supplement Fortitude: By The Docks Of Big Lake with any pledge over $15 (and you get access to the working drafts immediately, too). It's looking unlikely now, but if we hit $80k we'll get a campaign too! This is the new tabletop RPG from Jenna Moran, talented creator of Nobilis. It's a diceless game with the emphasis on character and story (though I must say the cool powers are very cool too). It's designed to work for multiple distinct genres, each mapped to a particular region of Town, and each supported by modular rules (such as variety in the pace of the in-game passage of time, and the different types of action you can receive XP for). Fortitude, for example, is inspired by the rural settings of some anime, and the Pastoral genre it supports emphasises the daily life of your characters with a gradually-unfolding story. Horizon, meanwhile, is a somewhat darker region of Town, where vampires and ghosts lurk and your character is more likely to tip over into obsession. Arcadia, the shopping district, supports a more urban fantasy or over-the-top comic feel (the latter is referred to as 'Techno'). And for epic fantasy there's always the surreal Outside, from where come the genteel but reality-eating Riders. It's well worth a pledge! Try Chuubo's Marvelous Wish-Granting Engine, a new tabletop RPG by the talented Jenna Moran, author of the fantastic Nobilis. There is thread for it in the Other RPGs subforum though. Primeval Thule Kickstarter. Sword and Sorcery setting for 13th Age, DnD 4E, and Pathfinder. The team consists of professionals and the setting looks great. I suggest reading the play report from their site too. Lots of fun. Oops, sorry, completely missed that - I only searched this thread! The ZEITGEIST adventure path hardcover compilation Kickstarter for Pathfinder and D&D 4th edition will end at 7 a.m. Eastern US Time, Sunday the 14th of July, 2013. Because of a great response by our backers we've blown through every stretch goal so far, except for the "I hope WotC's legal team let's us do this" promise to do a D&D NEXT conversion. We've now added a series of extra stretch goals that add content to the Expanded Player's Guide. If you're interested in playing ZEITGEIST, not running it, you can get the softcover expanded Player's Guide for $17. And as of this posting we have about 17 hours to reach those goals. So, thanks to all the stretch goals we've already reached, you may be wondering what all you get for a $60 pledge. First, you get whatever physical item you pledged for, such as the Act One color hardcover. Second, you get the PDFs of the compilations of Act One (due in January 2014), Act Two (June 2014), and Act Three (December 2014), thirteen adventures in total. These compilations will integrate the various stretch goal PDFs: the Expanded Player's Guide, the dungeon crawl Crypta Hereticarum, the game-day adventure Bonds of Forced Faith, the adventure vignettes Vagabond of the Mirror Moon, the appendix Monsters & Magic of the Revolution, and the Case Files of the RHC add-on, mini-adventures for those sessions when not all the players show up or you need a break from the main plot. We'll also probably provide all these add-ins as stand-alone PDFs (depends on how the layout works out). Third, you get the PDFs of the NPC, Ally, and Treasure Cards from all three acts. Fourth, you'll get access to Hero Lab files of all three Acts. Fifth, thanks to our partnership with Darkraven Fantasy Soundscapes you'll get a free download of their Bay of Corsairs soundscapes. That's a lot of entertainment for $60. So, I noticed that Stefan Pokorny from DF has backed this project http://www.kickstarter.com/projects/...sound-project/ to create custom music, sound effects, and voice overs for Tabletop RPGers, and he is publicly trying to push their KS through DF and other forums, so I thought I'd share since I love this project too. Not sure if anyone else does this, but our gaming group loves to use ambient audio while we play to set the mood. But, what has me kicked are the potential Monster sounds these guys want to create and that they have talent from even Diablo 3 working with them. I'm backing this sucker at $75 to get the Soundboard and all audio they create as it's finished. Maybe some of you guys (or gals like me) would find it useful. Last edited by KacyCrawford; 2013-07-16 at 03:03 AM. OK, a heads up about a Kickstarter for my first RPG product called Frozen Skies. Last edited by stormwell; 2013-07-22 at 07:03 AM.